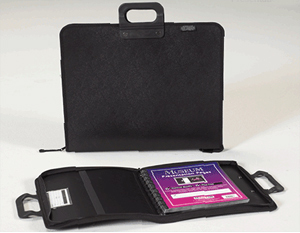 * The New Yorker is construction of polypropylene providing a classic but very durable Presentation Case. * Further, the New Yorker features: a rubberized handle for comfort even when the vase is fully loaded, non-skid rubber feet, and the industry standard multi-ring design for added safety for your presentation. * 10- Acid Free Archival Quality sheet protectors are included. * This water resistant case can double as a portfolio. * For 9x11 artwork. (Art supplies not included). 19" x 14" x 6"